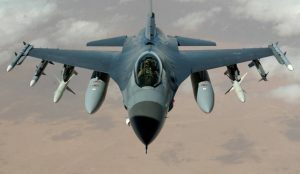 US defense and security company Lockheed Martin will deliver Bahraini defense forces 16 F-16 fighter jets worth $3.8 billion. Bahrain on Tuesday said the deal was signed during a defense exhibition in the Gulf kingdom. Under the deal, the Maryland-based company will supply 16 upgraded F-16 jets. Washington in September green-lighted the sale of military equipment worth more than $3.8 billion, including F-16 jets, upgrades, missiles and patrol boats, to the archipelago, which hosts the US Fifth Fleet. Relation between Bahrain, largely populated by Shia Muslims, and the US have improved under President Donald Trump who has vowed to help US gulf allies better defend themselves. Lockheed Martin’s Executive vice President, Richard Ambrose who was present at the signing of the deal said “Bahrain is the first country in the region to sign such a deal with the American company”. Posted by KanelkaTagba on Oct 18 2017. Filed under Gulf News, Headlines, World News. You can follow any responses to this entry through the RSS 2.0. Both comments and pings are currently closed.